I love pumpkin, it’s sweet, bright in colour, and appetising too. Its inherent sweetness and creaminess make the perfect centre point for any take of a heart-warming soup. 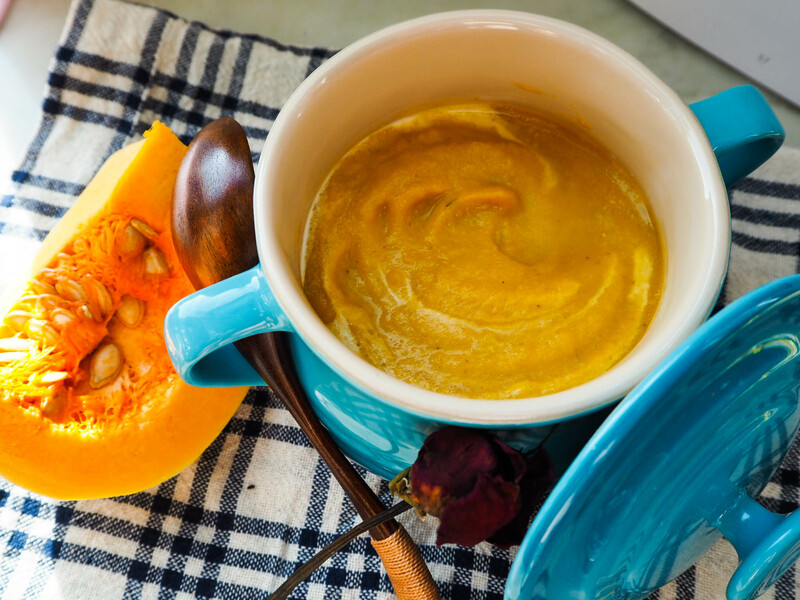 With many kinds of veggies blended together, this particular pumpkin soup recipe is naturally nourishing for your body, and soothing for the soul. Best of all, even if you dig into it you won’t feel that you’re eating anything heavy at all. Fill a pot 2/3 full of water and bring it to boil. Add the cauliflowers to the water and let it cook for one minute. Take the cauliflowers out and place them into an ice water bath; set aside. Add olive oil in a large, deep pot, and add the onion and saute on medium heat for 5-7 minutes until they start to become translucent and fragrant. Add ginger and garlic to the pot and cook for 3 more minutes. Add celery and carrot and cook for 5 mins. Add pumpkin, cauliflower, chicken stock, water, thyme, cumin. Turn the heat to medium high, bring the soup to boil, and let the soup simmer on medium-low heat for 30 minutes. Puree the soup with an immersion blender or in batches in a regular blender. While the soup is still hot, add butter and stir well until dissolved. Serve with heavy cream or milk when served if desired. Note: You can add extra water/chicken stock to the soup if you find the soup too thick for you.